When did I become so bad at predicting things? My hit rate on this trip has to be below 25%. Pathetic. In Grand Teton National Park I must have said, “I think Oxbow Bend is just up here on the left” about five times before it finally appeared. I don’t think a single one of my attempts to predict which areas of Yellowstone had cell phone coverage ever turned out to be accurate. And let’s not forget my prediction that the Jenny Lake hike would be two miles when it turned out to be more than four times that. So keep my track record in mind when I tell you I predicted that the highlight of my time in Glacier National Park would be taking photos of the amazing landscapes – steep mountains jutting up at unusual angles, green alpine fields full of wildflowers, waterfalls streaming down over jagged rocks… As I drove through Montana towards the park I saw those scenes so vividly in my mind I could have painted them (if I had any artistic ability, that is). And of course that meant I was destined to get ho-hum, run-of-the-mill landscape photos. The highlight of my time at Glacier – far and away – turned out to be the wildlife. Even before arriving at Glacier I had some wildlife luck. 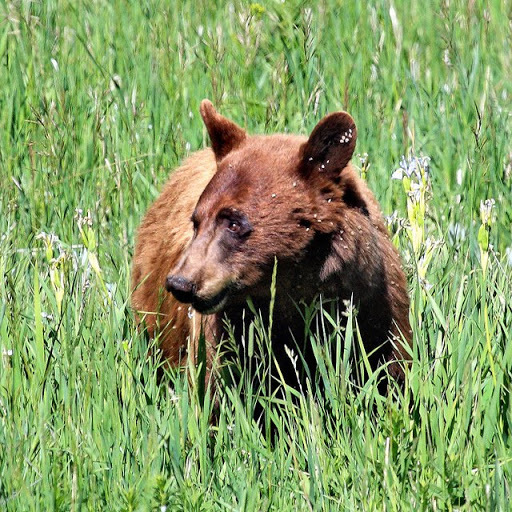 Passing through Yellowstone again I ran across a black bear foraging around in some tall grass. In one of my shots I was lucky enough to get that little white glint in the eye that seems to help wildlife photos come alive. 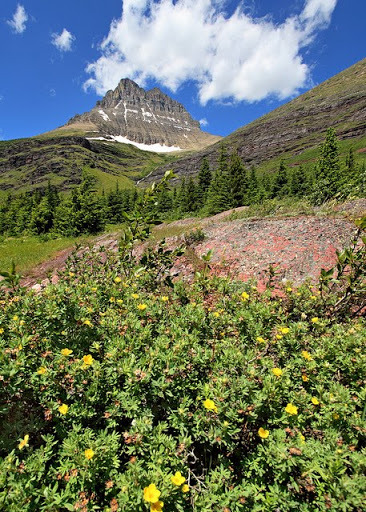 I made it to Glacier National Park’s western entrance in the mid-afternoon and set up my tent at an open spot in the Avalanche Creek campground. 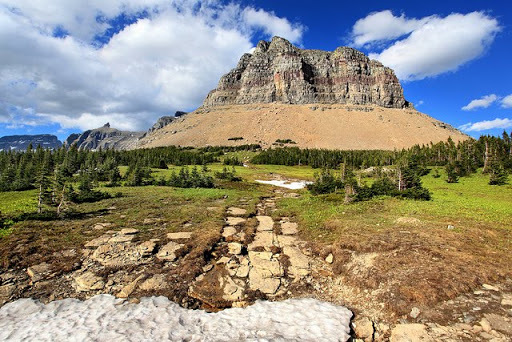 In the early evening I drove up Going-to-the-Sun Road to Logan Pass, where, as I was turning into the parking lot, a big white mountain goat darted right past my car. 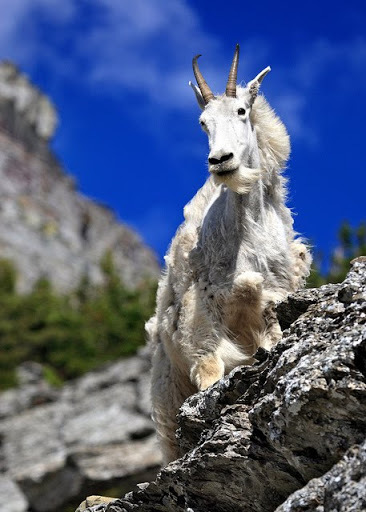 I’d been to Glacier once before and during that visit I caught a glimpse of some mountain goats from a distance, but I’d never seen one up close. 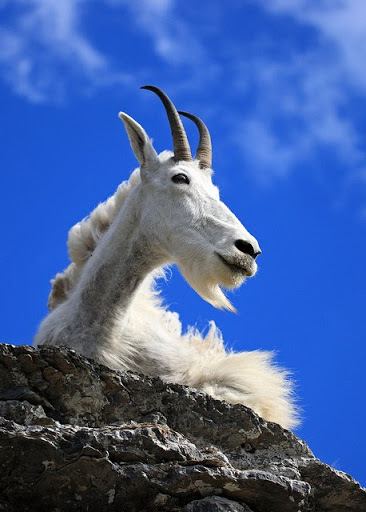 I parked as quickly as possible, grabbed my backpack with my camera and bolted out on a trail in the direction of the goat. 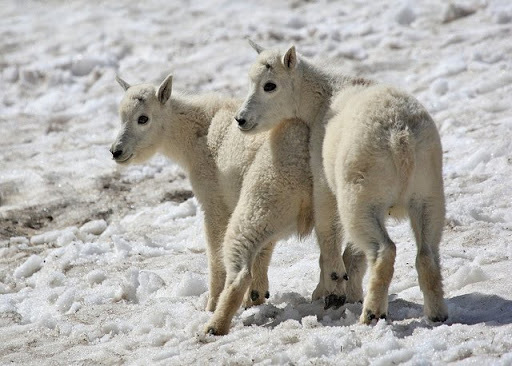 Within just a couple of minutes I came across an entire family of mountain goats – two adults and two kids. They appeared to be so habituated to people that as long as I stayed about 10 feet away they didn’t even seem to notice me. I can already hear the sarcasm… Oh wow, you saw a goat! Did you also see a chicken and a cow? Trust me, these aren’t regular goats – they’re badass super-goats that can weigh as much as 300 pounds and have long white beards that, from certain angles, make them look like Gandalf from Lord of the Rings. So it was pretty fun to hang out with the super-goat family for over an hour. I took photos from all different angles and tried to get some decent shots of them interacting. It took a while, but I finally decided the mountain goats had put up with me long enough so I started the short hike back to the parking lot. 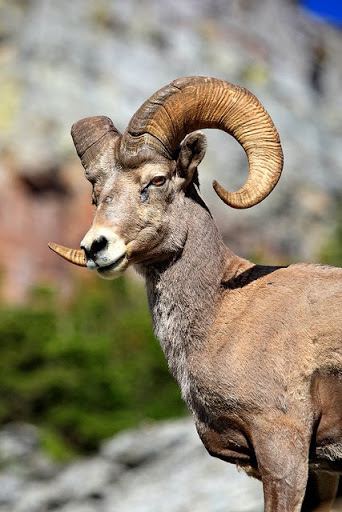 At one point I looked down to navigate through some loose rocks, and when I looked forward again I found myself staring at a group of six Bighorn sheep blocking the trail right in front of me. They weren’t quite as easy-going as the super-goats. I shot as many photos as I could while gradually giving them enough room to continue on the trail without ramming me into a tree. 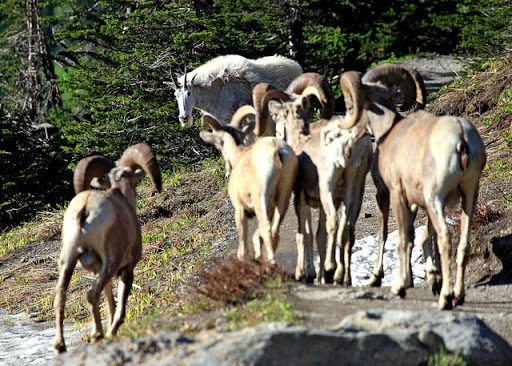 The mountain goats, meanwhile, had decided to follow me back up the trail, which led to a scene that looked like two gangs crossing paths in the movie The Warriors… Would the Baseball Furies make room for the Rogues to pass, or were we headed towards a cloven-hoofed dust-up? 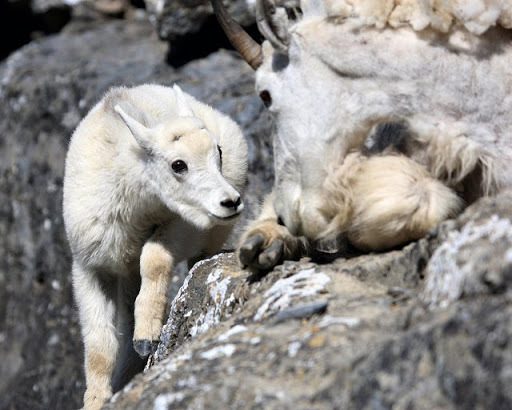 The outnumbered mountain goats – in the best spirit of non-violent conflict resolution – decided to casually graze in the field next to the trail, allowing the sheep to pass. 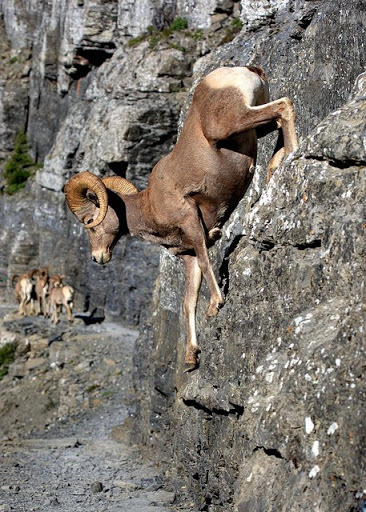 You have to be impressed when badass super-goats demonstrate that discretion truly is the better part of valor. I think we all learned something that day. The Bighorn sheep didn’t let me get as close as the goats did, but they were still pretty tolerant. 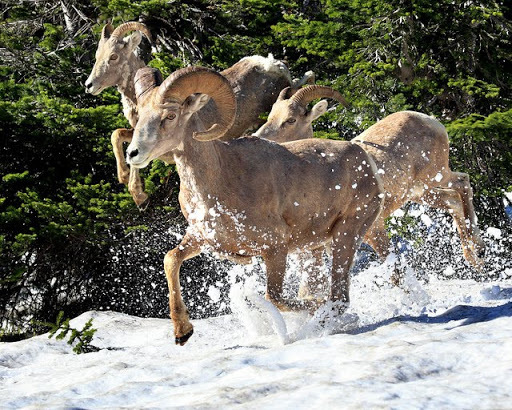 At one point a noise spooked them into a full sprint and I was able to get some shots as they bounded through the snow. Again I probably overstayed my welcome, as the most expressive of the sheep made clear to me. 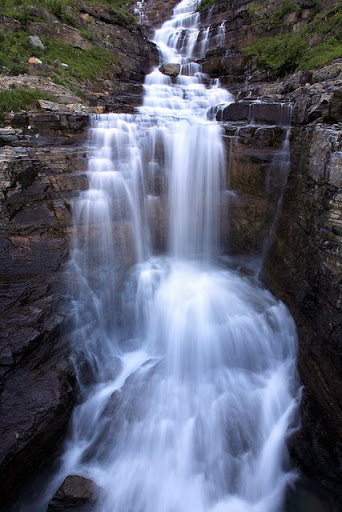 Thanks to roadwork, Logan Pass was closed from 9pm that night until 7am the next morning, which meant I had to head down towards my campsite before sunset or risk getting stuck on the wrong side of the pass. It also meant I couldn’t get back up to the pass before sunrise, so I used that as an excuse to be lazy and sleep in. The next morning I took a few landscape photos, continued on to the end of Going-to-the-Sun Road, then curved up and back around to the Many Glacier area of the park. Just back inside the park I saw a tell-tale pack of tourists pulled over to the side of the road, clearly excited by an animal of some kind. 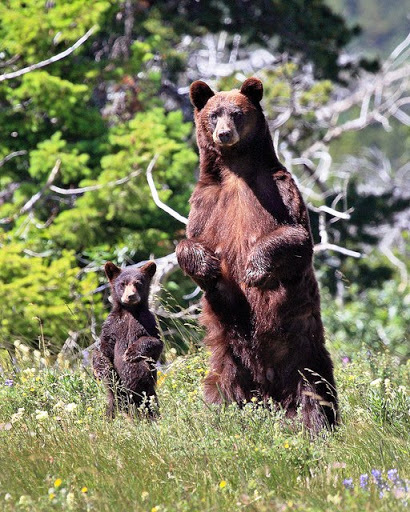 Turns out they were watching a black bear with a couple of cubs. At Yellowstone there were always rangers around making sure that we tourists stayed far away from the wildlife, but there were no rangers in sight this time so I took off on a side trail that I hoped would give me a better angle for photographs. I didn’t end up getting any closer than the people on the road, but I surprised the mom enough that she reared up to see what I was doing. 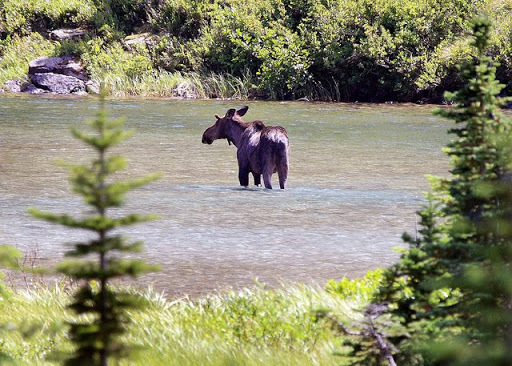 That afternoon I hiked to Bullhead Lake and on the way back a fellow hiker was kind enough to point out a moose wading in the water off in the distance – the first moose I’d seen on the entire trip. 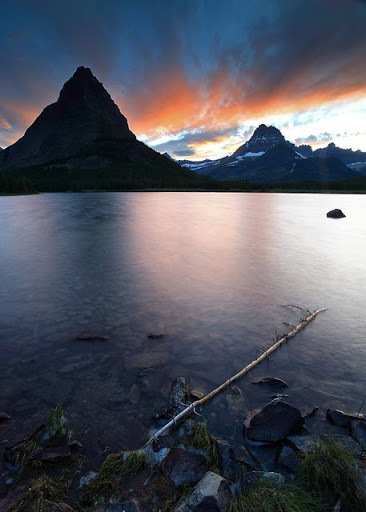 In the evening the clouds looked like they might be interesting so I hung out around Swiftcurrent Lake at sunset and took photos. I got right back up before sunrise the next morning, hoping for a totally calm, reflective lake and some great light, but the entire Many Glacier area was grayed-out with low fog. It was tough to leave Glacier after just a couple of days, but I packed up and drove out later that morning so I could make it to Kansas City in time for my dad’s birthday. Those baby animals are KILLING ME. The smiles on the teeny goat faces!! And the cub who has no idea what is going on but wants to copy mom?! They are amazing and I love them. “badass super goats”–classic. Love it. Great photos, Rob! Badass Super goats!!!!!!!!!!!!!!!!!!!! YAY! Good times… I loved watching you edit these photos and the blog- very fun! Can't believe you left already. We miss you! Come home again soon please. Great photos and blog! Hope you had fun on the Colorado adventure! Hey! 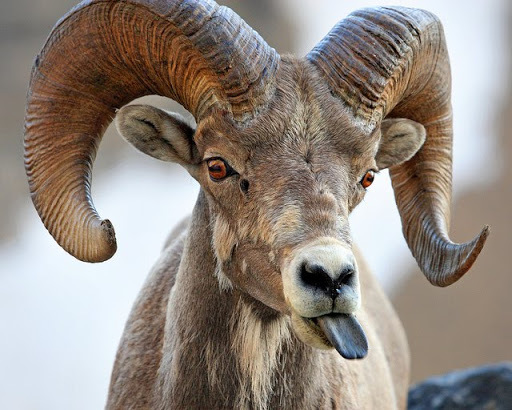 A bighorn! That's why I come up here. These are just amazing photos! 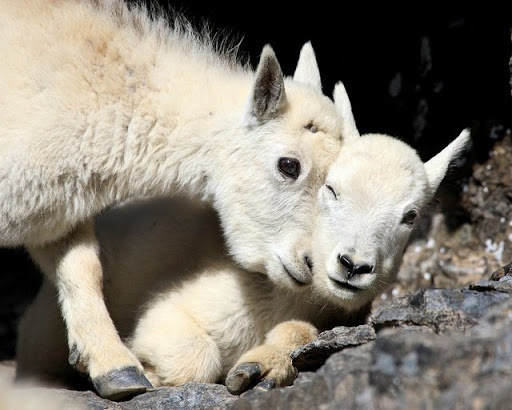 You had me cracking up at the goat photos and then my heart melted a little for the “brother and sister” shot. I think that's what makes travel fun – you go in with expectations and always get surprised with something else happening.